Make friends with the Pillsbury Dough Boy! Is it the Moose that makes Montana’s? This was one Friday night when we did not have to decide on a venue for our usual evening out. It was Amber’s 12th birthday celebration and she had picked Montana’s at the Gloucester Centre in Ottawa’s East End as her restaurant of choice. Where we went: Personally, I don’t see the attraction of standing up wearing grubby moose antlers whilst being serenaded by a bunch of out-of-tune, somewhat less than enthusiastic servers. The kids though, seem to love it! The thing with kids, when they pick a restaurant, it is rarely the food that is their prime consideration! Plus, they seem to have short memories when it comes poor food and/or service! Anyway, Montana’s must at least be pleasing some of the people some of the time because today, just like all our other recent visits, was a packed house and a LOOONNG wait to be seated. 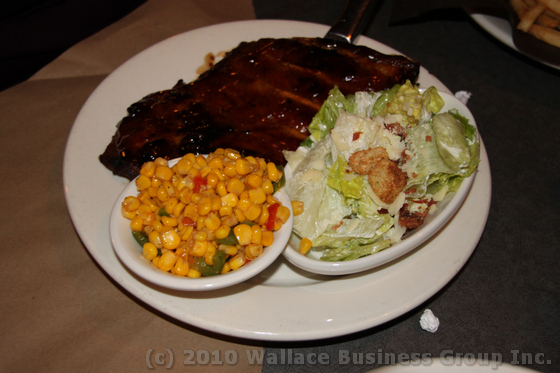 What we ordered: Like so many other restaurants of its ilk, Montana’s offers a fairly standard menu of chicken, ribs, burgers and fajitas! 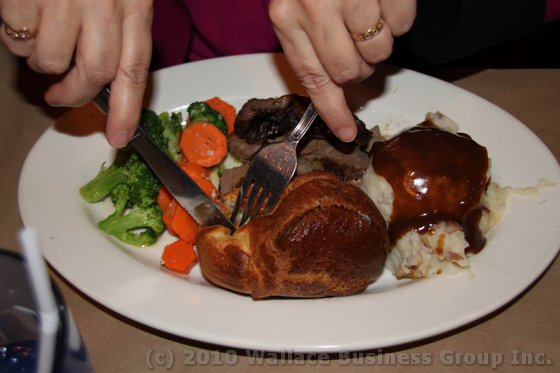 Since none of those grabbed my fancy, I went out on a limb and ordered the pot roast with Yorkshire pudding. I should perhaps taken a hint from the fact that traditionally, Yorkshire pudding would be served with roast beef, not pot roast. Where would they get the drippings to give the batter that extra zing? Also, the idea of mash potatoes in addition to the Yorkshire seemed like a little too much starch for me, so I opted for the corn as a replacement. In a somewhat atypical move, Dorothy also ordered the same dish but stuck with the mash (pictured below). What we got: I wouldn’t say that our meals were horrible but nor were they great. The Yorkshire pudding looked good but was a little tough. The beef was a little bit dry and tough and lacked a little on flavour. The truth is that when the get-together is a birthday celebration, the food is almost an afterthought compared to the companionship. 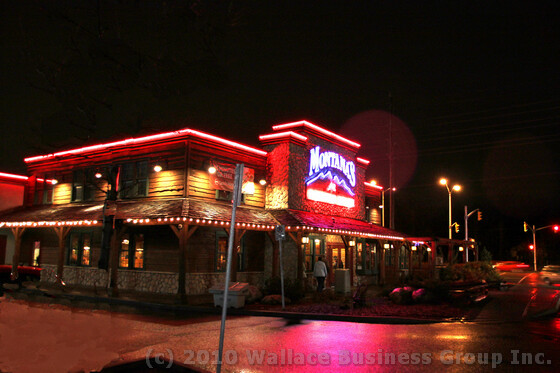 Nobody in our very large group had any major complaints and perhaps that is what Montana’s is doing right! Since I am not a huge fan of most birthday cakes, I took a chance on the ‘individual indulgence’ of fudge brownie. To say that it was a disappointment is an understatement. It was really more like a square of chocolate sponge with a dollop of ice cream and a squirt of chocolate sauce. More of an imposition than an indulgence as was attested to by the fact that Dorothy was not too eager to help me finish it. Worthy of note: There is no doubt in my mind that since recently frequenting such establishments as Cordon Bleu Bistro, Wellington Gastropub, Fraser Café and the like, I now use a slightly different yardstick than heretofore. The popularity of Montana’s in general is evidence that all is not bad here. I would temper this observation with the unusually low rating this particular location receives on Urbanspoon (see below). 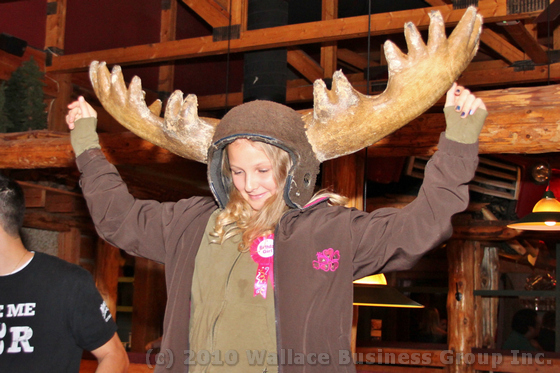 In any event, Amber’s birthday party went well and she wore the moose antlers with aplomb! Positives: Good atmosphere. Great for kids! Prices are not out of sight. Negatives: Food is so-so, wait times can be excessive. Recommendation: Hung jury! Some love it. We find it just OK but not outstanding! •One of the biggest racks of antlers ever found was 81 inches across! •One of the heaviest racks of antlers ever found weighed 77 pounds! •A bull moose looses his antlers each and every year!